– World record holder and Olympic champion David Rudisha, reacting with class after fading to just 7th (1:44.87) in the last 100 at the 2014 Pre Classic. Morgan Uceny Runs 2:00.29 and NBB Twilight Meet! Amos is the real deal - takes down Rudisha AND Aman in 1:43.63!! 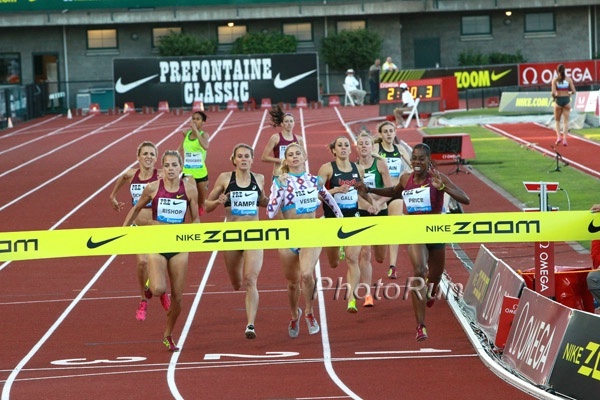 Could Jordan Hasay be the next Galen Rupp? 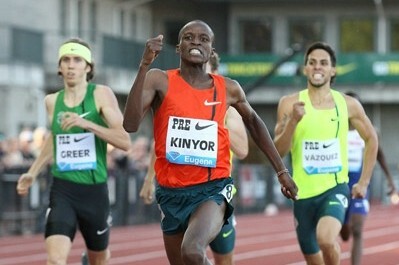 Men’s Mile LRC Ayanleh Souleiman Runs 3:47; Manzano Returns To Winner’s Circle – 9 Takes From 2 Great Miles At 2014 Pre Classic A ridiculous 22 men broke 3:55 on Sunday in Eugene. We give you the scoop. *LRC US HSer Blake Haney Runs 4:10 Haney feels he’s fitter than last year when he ran 3:55 for 1500 but this race was set up to run 3:55. Men’s 800 & 5k: LRC David Rudisha And Mo Aman Lose As Nijel Amos Wins; Caleb Ndiku Outkicks Alamirew As The Americans Struggle David Rudisha had a tough last 100 in the 800 and the American men had a tough last half in the 5,000. 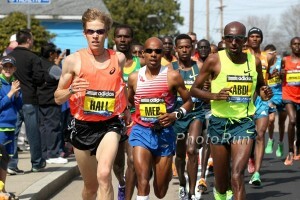 *MB: Amos is the real deal – takes down Rudisha AND Aman in 1:43.63!! 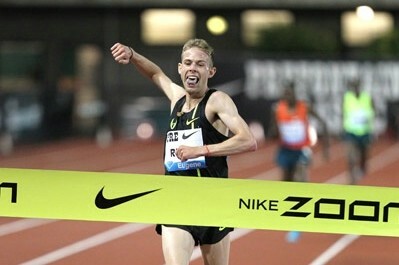 LRC Galen Rupp Runs 26:44.36 To Break His American Record 39 years to the day after Steve Prefontaine died, Galen Rupp came within .62 seconds of running Prefontaine’s 5,000m PR back-to-back. After the meet, it was also announced Galen’s wife, Keara, is expecting twins. 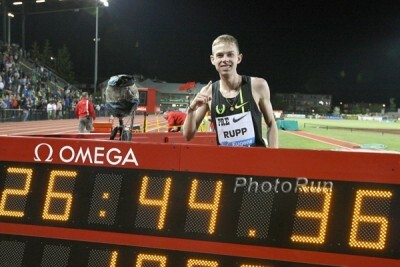 *Where does Rupp come in your all-time greatest American distance runner list? Kennedy Kithuka won the 10,000 in 29:05 just ahead of Edward Cheserek. Live Results / Start Lists / Schedule For 2014 NCAA East Preliminary Round Michigan’s Erin Finn won the 10,000 in 33:13. UK’s Holly Bleasdale Will Skip 2014 Outdoor Season To Focus On 2015 And 2016 She was injured a year ago and says she still hasn’t got back to her top fitness. Greg Rutherford’s Controversial 8.51m NR Long Jump Officially Ratified By British Athletics The group said the video evidence was “inconclusive” so upheld the decision of the referee at the event. 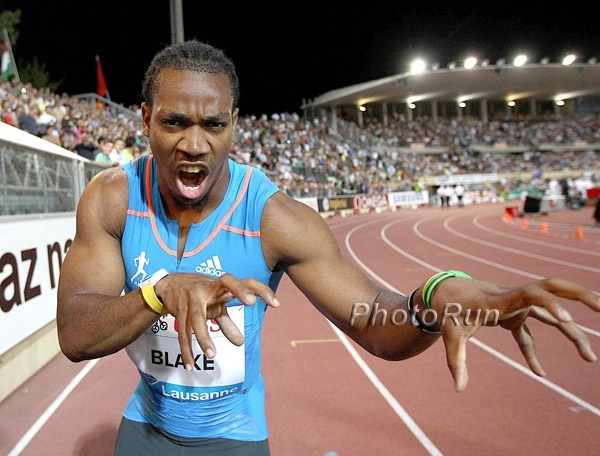 IAAF: Should Yohan Blake Be The MVP Of The World Relays? Brenda Martinez gets mention for anchoring both the USA 4 x 1,500 and 4 x 800. IAAF Work, Rest And Play Interview With Christian Taylor Oly TJ champ’s favorite workout is 3 x 350m. Interesting fact: Taylor longboards a mile and back to practice. Yohan Blake Says Michael Jackson Was One Of His Heroes And He’s “Learned A Lot” From Him Blake says he cried when he heard about Jackson’s death in 2009 and didn’t train for a week. 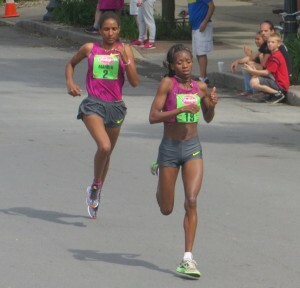 LRC Fast Women: Hellen Obiri (3:57.05), Sofia Assefa (9:11.39) And Mercy Cherono (9:13.27) Run Fastest Times Ever In US For 1,500, Steeple And 2-Mile Those winning times were very impressive but American fans were pumped by Jenny Simpson’s PR and Shannon Rowbury’s AR. LaShawn Merritt And Kirani James Both Break 44.00 In Photo-Finish Classic! Shelly-Anne Fraser-Pryce Finishes Last In 200m The 200 was won in a HUGE upset by 2011 NCAA LJ champ Tori Bowie in lane 1. Bowie just started sprinting seriously this year and it was just her 3rd 200 since 2010. MB: Morgan Uceny Runs 2:00.29 and NBB Twilight Meet! LRC Women’s 800: Chanelle Price Hangs On; Colorful Maggie Vessey Takes Second; Mary Cain Fizzles In the men’s 800, Job Kinyor beat Elijah Greer and Eric Sowinski. LRC David Rudisha Talks About His Return At Prefontaine Classic King David is set to return to the circuit after a year+ absence. Is he in shape? Will he win? Plus, fantasy track guys and gals, guess what his agent says he can run a 5k in? LRC News And Notes: Highlights From The 2014 Pre Classic Press Conference We caught up with Brittney Reese, Ashton Eaton, Renaud Lavillenie, Allyson Felix and Justin Gatlin, who says he wants to race both Usain Bolt and Yohan Blake and supports Dennis Mitchell. A story by Xinhua on her retirement was false according to her manager. Interesting Story: Wisconsin-Oshkosh Runner Christy Cazzola Finishes Career At 28 Years Old With A Record 17 NCAA DIII Titles Cazzola was a high school phenom and had offers from DI schools, but decided it wasn’t for her and spent 5 years away from the sport until she returned as a wife and mother. She actually ran XC nationals one year while pregnant. Tyler Andrews Won Vermont City Marathon In 2:20:27 It was his second marathon as his first was in Boston, where he ran 2:21:30. 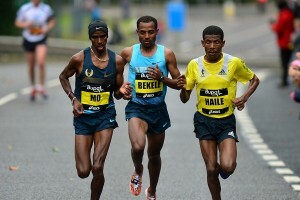 Will We See Two More WRs From Dibaba? Genzebe Dibaba And Her Coach Jama Aden Talk About Her Summer Goals Of Breaking The 2,000 And 2-Mile Outdoor Records And Her Loss In The Doha DL 3,000 She was expecting between 8:14-8:18 in Doha (she was 8:26). 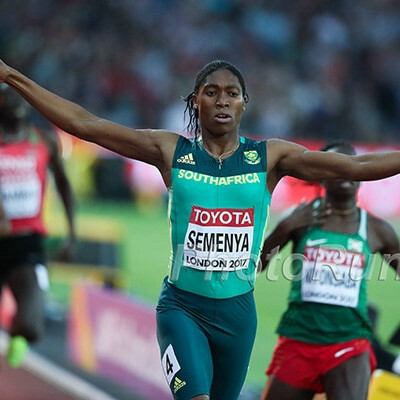 She’s going for a 5,000 PR at Rome DL on June 5th and then will attack the 2,000 WR on June 17th in Ostrava. Megan Hogan was the top American. Melody Fairchild won the Masters race. Bongmusa Mthembu Wins Wild Comrades Marathon In His First Attempt There were three different leaders during the second half of the race, including SA marathon record holder Gert Thys (2:06:33). Gert Thys Took The Lead Just After Halfway He was behind at halfway but now seems to be on his way to victory. Be Inspired: Meet Steve Way – England’s Commonwealth Games Marathoner Who 7 Years Ago Weighed 231 Pounds And Smoked 20 Cigs A Day Now he’s a 2:16 guy who runs 130 to 140 a week and works a 9-to-5 job. 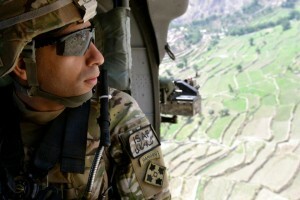 *MB: former NOP strength coach speaks on drugs! Alexa Efraimson Runs 4:33.29 National 1,600 Record To Win Washington State Meet The previous record was 4:33.86 held by Christine Babcock. Evan Jager Won A 1989 Ford Mustang When He Was In 8th Grade When Jager was 12, his dad said he would buy him one if he broke 5 minutes in the mile and when he was 14 he did it. 60 Years Ago Yesterday, Diane Leather Was The First Woman To Run A Sub-5 Minute Mile She ran 4:59.6 and eventually lowered her WR to 4:45.0. 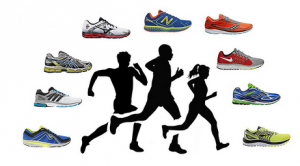 Recommended Read: “They Might Be Ryans”: Article On Group Of Sub-Elites Living, Training And Trying To Make It At Altitude In Flagstaff, AZ The group (which includes LRC’s 1.1) moved to the town that pros like Nick Arciniaga and Ryan Hall call home to chase their running dreams. 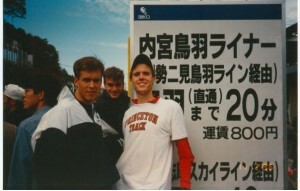 RR#2: Runners World Profile On Matt Elliott: “America’s Fastest Kindergarten Teacher” Elliott has came a long way from a guy who ran 4:42 in the mile in HS as he finished 4th at US Champs last year. WSJ: “Breaking the Five-Minute ‘Beer Mile’ Brews Controversy” As Critics Say James Nielsen Didn’t Do Can-Over-The-Head Maneuver On First Beer The video has gone viral with more than a million views on YouTube and Nielsen says he’s actually been approached with endorsement offers from apparel and beer companies. Good Read: Recently-Adopted Ethiopian Orphan, Abreham Anderson, Invited To Bolder Boulder Elite Press Conference To Hang With Ethiopian Pros The kid is in Jr. high and started at 7:20 in the mile and ended the season at 5:03. 2024, here we come.